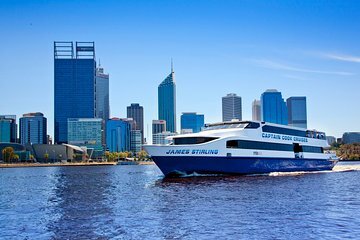 Spend lunch on the water during this Swan River cruise from Perth. As you glide leisurely down the river from the city to Fremantle, a historical port city located where the river meets the Indian Ocean, feast on a buffet lunch of seafood, hot dishes, salads, fruit and more. While you eat, take in views of Perth’s waterfront suburbs and yacht clubs. Your lunch cruise starts in central Perth, where you’ll board you boat and set off down the Swan River. Admire views of Perth’s western suburbs and yacht clubs as you float along the water, making your way to Fremantle, a port city on the other side of the river, where it dumps into the ocean. The round-trip cruise returns to Perth. There were 14 in our Party, a little squashed but everyone enjoyed the trip. The Staff were so helpful both getting on and off the boat with walkers, also up the 4 steps to the food. ( which was delicious.) Thank you all for making our outing a special day. I Highly recommend the Luncheon Cruise. All cruise members were very nice, polite , and helpful I was happy with my decision that I booked with Fremantle Lunch Cruise, I will do it again in the futiure whenever I am in Perth Australia. Thank you for making our trips delightful. Another nice day to remember on the Swan River. Good commentary of local points of interest. Nice lunch. Would recommend. It was well organised so people couldn't jump queues, which was very comforting. The crew members were all smiling and very helpful, thanks for a lovely trip. My sister and I had a great day, staff very helpful and friendly, food excellent. It was so relaxing, good commentary of all the special icons in Perth. I gave it to my sister for her 70th and she loved it and talking about getting all her girlfriends together to do it again. . It was a fantastic trip. The crew were polite and efficient. The commentary was informative and entertaining. There was plenty of delicious food - great prawns. My group thoroughly enjoyed the trip. It seemed to pass so quickly. A perfect way to admire our beautiful Swan River.